If you are experiencing any issues with our Windows app, you can now send a diagnostic report to our support team so that we can investigate the issue further. Note: This article only applies to our Windows application. This does not apply to our users who use the browser extensions on the Windows platform. 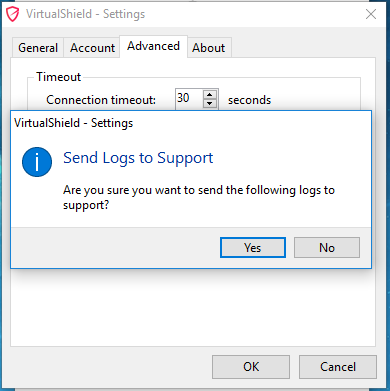 Please only send logs if you are experiencing a specific issue. 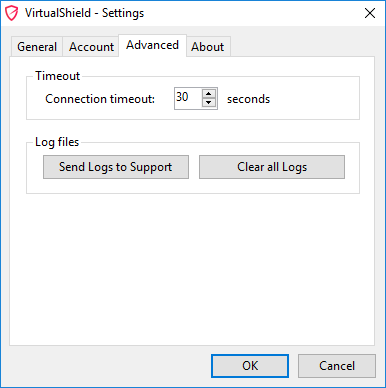 First, open up the VirtualShield Windows application. Click the Cog/Gear shaped icon to open the Settings, then select the Advanced tab. Click the Send Logs to Support button. You will be asked to confirm in the next screen. When prompted, select Yes to confirm. That's it! Our support team will get back to you as soon as possible.